Ancient Chinese legends celebrate the wisdom, benevolence, and diligence of Emperor Yao (2356 – 2255 BC). 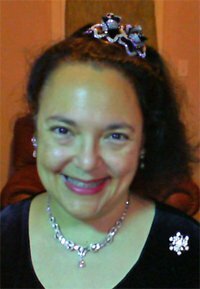 In his poetry, he wrote, “The drum for raising alarms is now covered in deep moss, and the fowls are left undisturbed,” which referred to the drum he placed at his humble home’s gate. 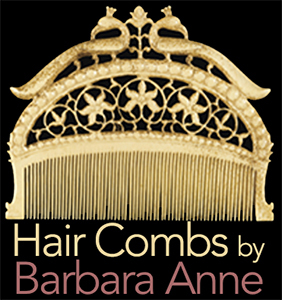 By speaking into it, his subjects could voice their concerns. 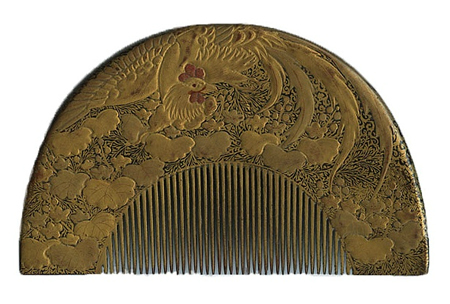 Japanese comb makers have portrayed Emperor Yao’s poem in both Edo and Meiji pieces, where a rooster guards the Emperor’s drum in a flower garden. Here are two examples, both tortoiseshell painted with gold maki-e. 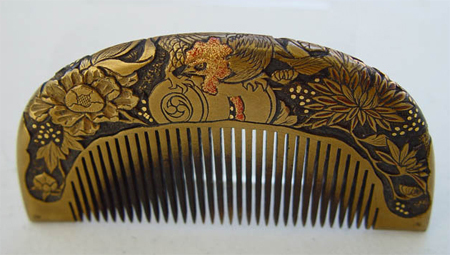 The first is Edo from The Miriam Slater Collection, and the second is a Meiji comb for sale on Trocadero.